Driving through torrential downpours to pick up a dog from a Logan, West Virginia, animal shelter, Robin Kilgore pulled up to the gates to see a cardboard box sitting on the ground. When she got out of the car, all she could hear over the sound of the rain was crying. 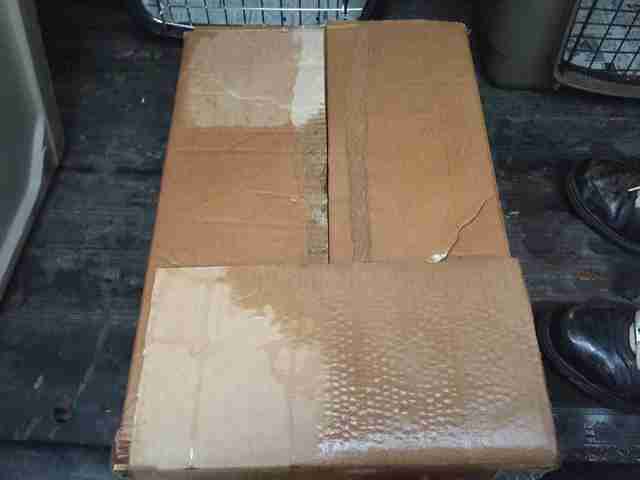 “It was raining super hard and the box was soaked,” Selena Marcum, president of The Paws Squad rescue, told The Dodo. Marcum was the first person Kilgore called after finding the box. 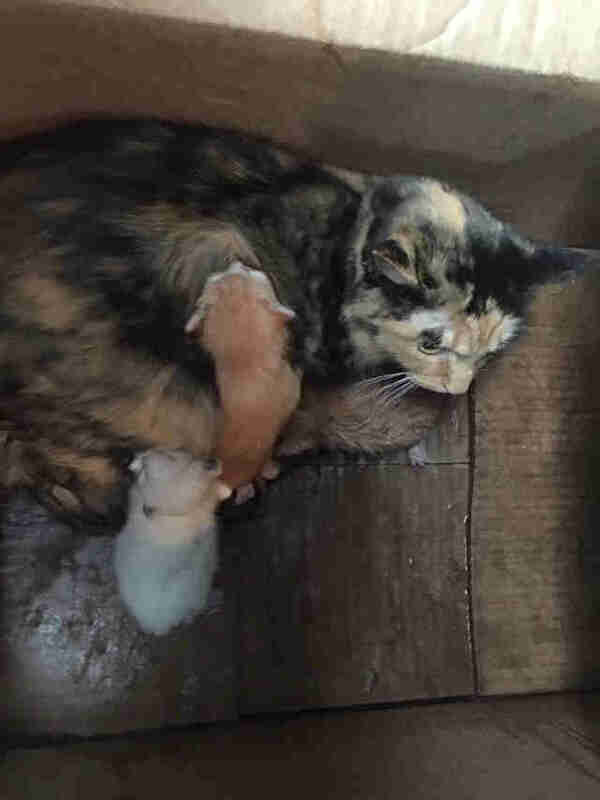 When Kilgore opened the box, a mother cat peered up at her — and three newborn kittens were shivering at her side. Luckily, Kilgore had already been planning to drive a dog to One By One Animal Advocates later that day — so the staff there offered to find a foster home for the young family. She dried them off and loaded them up for the trip. 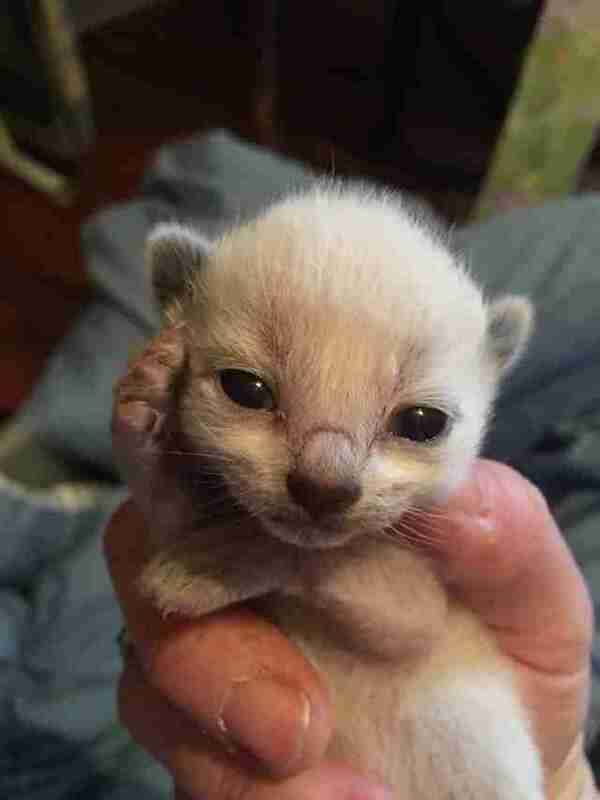 Vets estimated that the kittens were only 3 or 4 days old — so they wouldn’t have survived in those cold, wet conditions for much longer. According to Marcum, it’s very common for people to dump animals in front of the county shelter before the facility opens its doors for the day. “We’ve driven over to pick up animals before and have seen them stuffed in boxes, or tied to the front gates outside,” she said. 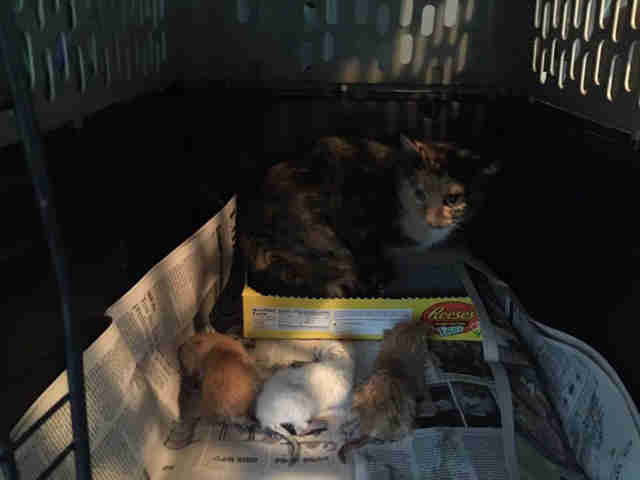 While it’s unclear how long the cat and her babies were out there in the rain, they fortunately didn’t suffer any health effects and are now living in a foster home. 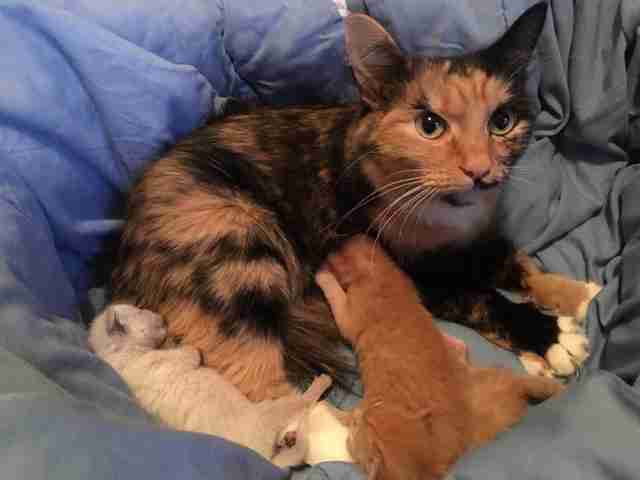 The mother cat is now named Gypsie, while her three boys are Cheddar, Velveeta and Panda. If you’re interested in adopting Gypsie or her sons, you can contact One By One Animal Advocates at onebyoneaa@gmail.com. You can also donate to their vet care.